Another hit! 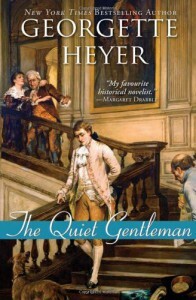 Once again, I thoroughly enjoyed Heyer's witty writing and dialogues and her colorful characters. This has also quite hit home for me, personally. I know when something is just so emotional for me when I get a tingling sensation in my hands. And then my chest aches, and there's a threat of tears. And damn, when Drusilla was talking to herself in the mirror, convinced that the quiet gentleman, Gervase, would never have feelings for her, and that his amiability towards her was simply courteousness, I cried. You see, as people perceive Drusilla (what a name! Even in Edwardian times it was an archaic name), she is sensible and totally plain. What hopes indeed does she have when there exists Marianne, a Beauty, of which Gervase can't even deny? What I really love about Heyer is how she chooses her protagonists and the different way she conducts a romance. Though sometimes she writes novels about a Cynical Man falling for an Innocent (like in The Corinthian), she also writes about romances not based on passion, but a quiet kind of romance, and her characters are not your typical Hero and Heroine. In The Quiet Gentleman, Gervase is soft, a dandy, but beneath his gentleness is a wily and intelligent man. Drusilla is plain, sensible and dependable. Throughout the book, no one really assumes she would catch the Earl's affections. And indeed, the book was not focused on how they fall in love, instead it focused on the threats to Gervase's life, and his relationship with his brother. The romance simply was there, you just had to read between the lines. And be delighted with how things worked out. I loved how at first Gervase thought Drusilla was dull. Like all young men in their village, he was smitten with Marianne, the Beauty. I loved how Marianne was not presented as a Beauty without Brains or with a mean heart, but simply a Beauty, friendly and admired by women and men alike. And yet, look how things turned out. *4.5 stars I still can't believe that resolution, though. Theo, the cousin, attempted to kill Gervase 3 times! And tried to frame Gervase's brother for it! And they let him go. Ah well.